This book is a biblical fiction set in Ephesus during the time of Paul. I have always enjoyed history, when its mixed with Bible even better. Tracy makes it come alive. The way she describes the places, and people of Ephesus , you feel like you are there watching the story unfold. With a a biblical fiction, I like to go back to the bible and read the story or passage again and compare it with what the author has to say. Ephesus was a place full of darkness and evil. Sorcerers practiced openly and freely, and many people were possessed. The temples of the false gods and goddesses lined the city. Daria is fleeing a past that haunts her, but her new life is not much better. The same things that haunted her then seem to be infiltrating Ephesus too. Daria is working as a tutor employed by Lucas, a local wealthy business man with a secret in his past also. She sees where he is headed, but is not sure if she can stop him. In the meantime, Daria is drawn to a group of the followers of The Way. Their leader is a man named Paul. With their help, will she be able to save Lucas in time, or will he succumb to the darkness? I have read several books by Tracy Higley and enjoyed all of them. She works hard to captivate her audience and help them grasp the whole picture. As I read this book, I also took the time to re-read the story of Paul in Ephesus and found out some very interesting information, I had forgotten or overlooked before. In light of Tracy's novel, I could picture what was happening there. Tracy's book has held me captive and I have enjoyed reading it very much and look forward to reading many of her other books. Tracy L. Higley started her first novel at the age of eight and has been hooked on writing ever since. She has authored nine novels, including Garden of Madness and Isle of Shadows. Tracy is currently pursuing a graduate degree in Ancient History and has traveled through Greece, Turkey, Egypt, Israel, Jordan and Italy, researching her novels and falling into adventures. See her travel journals and more at TracyHigley.com Any information you would like on the book can be found on Tracy's So Shines the Night page. She is also on Facebook, Twitter, and Goodreads. Tracy does alot of traveling as you can see in the above video to ensure accuracy in her writings. I think that is pretty fascinating and exciting! 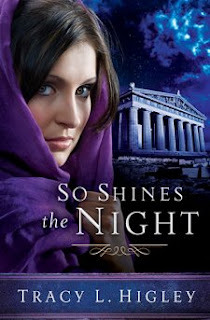 And Tracy has a GIVEAWAY on her blog for a Kindle Fire and signed copies of this book. Just ENTER HERE! She also has a $50 Giftcard GIVEAWAY for those who connect with her blog. Her book is available on AMAZON or other online retailers. Have you read any of Tracy's books? If so which ones? Do you enjoy reading Biblical fiction? These are some of the terms and people that caught my attention in this novel and re-reading of the account in the Bible of Paul at Ephesus: The Way, Lecture Hall of Tyrannus, Seven Sons of Sceva, and Demetrius. Do any of them ring a bell with you? First time I have heard of the author, sounds great, my husband would really enjoy this book he really enjoys this genre. I've heard of this author, and saw this book up for review. I haven't read any of her books yet, but this looks good. Thank You!